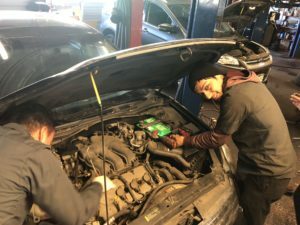 Here’s Part Two of our Denver Community Give-Back: 2018 Holiday Car Donation, with a peek behind the scenes and a shout-out to everyone involved. 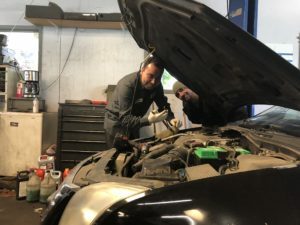 We gave you the background in a previous post about the terrific idea our shop owner, Marc, had earlier this year: find, fix up and give away a vehicle this Holiday season to a family in need. We’ll be giving the car away Wednesday, November 21, 2018 at 11am! We are really excited and hope you can join us by stopping by the shop for this heartwarming moment of community giving! 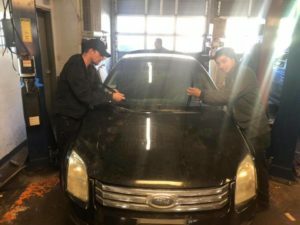 After securing the car from Dr. Miaken Zeigler, Zeigler Chiropractic and her husband Steve, we set out to find a home for the 2006 Ford Fusion. We hooked up with an organization called There with Care who helps families in need that have children with critical illness. In no time, they found a family that had a huge need: a single mom with 3 kids, the youngest battling cancer who just completed a tough round of chemo. We had quite a list of items to work on to bring the car up to speed. Our crew worked hard to complete everything in time for the give-a-way. Here’s a few shots of the guys in action. Yesterday, we put the finishing touches on the car, got it over to emissions, and have all the paperwork in place to hand over the keys to mom. She won’t have to deal with anything except pile the kids and herself into their new family car. To top it all off Marc’s brother Jay and his company Overley’s are going to fill the car with Christmas presents for all the kids and mom. Did we mention that the day we present mom with the car is also her birthday? The stars were aligned on this giving project, no doubt about it. Huge shout outs go to Factory Motor Parts, National Tire Wholesale, and Waterworks for all their help and generous donations getting this car up to speed and on its way to a new home!! We plan to share one more follow-up post with you including photos taken on the day we present the car to mom and the kids!